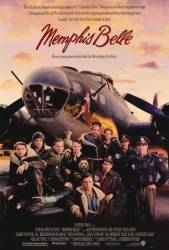 Continuity mistake: After the Memphis Belle drops its bombs and scores a direct hit on its target you see the Memphis Belle lift up and turn right with the bomb bay doors closed. The next scene the bombadier says "okay, bomb bay doors, closing" and you see the doors close again. Continuity mistake: When the bottom turret is shot out, Rascal is hauled into the aircraft, and although the turret is completely destroyed, when the Belle lands, the bottom turret is visible and intact again. Deliberate mistake: When the crew are piling into their jeep to ride out to their aircraft, the gunners ask the officers what their target is, and are disgusted to hear that it is Bremen, a tough one. The gunners should know their target already. Gunners were briefed on their target, and told what kind of fighter opposition to expect. Revealing mistake: The B17 that crash lands in the beginning appears quite realistic, until during a head on shot when you can see daylight through the clear nose from a window in the back of the plane. This shows it to be model as in the real plane bulkheads would block this from happening. Visible crew/equipment: In the scene where Dan is being attended to by the crew after he has been hit you can clearly see that it is a prosthetic arm that they are holding up and not Dan's. Continuity mistake: When the 3rd engine is going out, you see both of the landing gears are up, but it was just moments before that Dennis already lowered the left landing gear. Continuity mistake: In one scene, Jack discovers the 'couldn't get laid last night' note Genie taped to his back, then a couple of scenes later, when Rascal is telling the crew the joke he heard from one of the waist gunners from Windy City, the note is taped to his back again. Revealing mistake: When C-Cup's nose gets clipped and the guy falls out, it is most obviously a doll/dummy falling out.